The Main Hall is a large, flexible space, flooded with natural light. 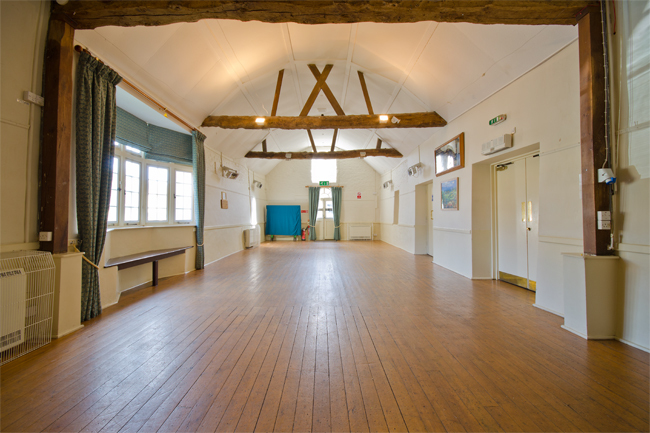 Its beautiful vaulted ceiling and exposed beams reference the hall's historical roots. It adjoins a large pre function space and a well-equipped kitchen with bar servery. We've had a wide range of functions held in the hall. It's such a flexible space that it can accommodate large and intimate gatherings alike. If you're looking for the perfect venue for your next event get in touch. We strive to provide everything you need to put on the perfect event. If you have any specific requirements, please let us know and we will do our best to accommodate you. And we can introduce you to selected caterers, PA system hire companies, florists, entertainers and others. Special per delegate rates available on request. If you have any questions about the hall, would like to visit or make a booking, then please contact Janet Vinnicombe, the Hall Manager.